I intend to set the pavement on the diorama with stones. Not the street part, but the pavement, because that is how I remember certain areas from my childhood. 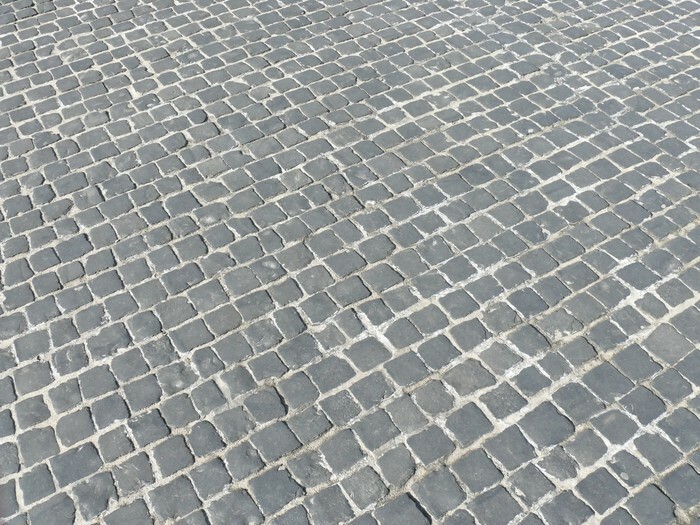 For that purpose I have watched a number of YouTube videos on how to model cobblestones. 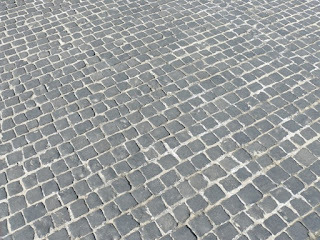 Now, the term "cobblestone" is often used both when referring to cobble-sized roundish stones ("kullersten" in Swedish) and when actually referring to sett paving using quarried stones, also called Belgian blocks ("huggen sten" in Swedish). What I am after is really the latter, but the videos mostly refer to cobblestones. Here is an example of the type of stone I mean. Next, the strip is cut into 4mm lengths, creating cubic pieces of cork. Here a number of "stones" have been glued to a piece of foam, creating my test patch. In my test patch the stones are not staggered. In real life, cubic stones seems to sometimes be staggered and sometimes not. Often some rows are staggered and others are not, as in the picture above. The tedious part, as I learnt from the video, is that you really need to sand the edges of each stone. Otherwise they will look unnaturally sharp. That part, which I agree turned out to be crucial, is really slowing things down. But if that is what it takes, I'm prepared to do it.